Play the wonder of World Class sports driving Race Freaks game in this winter Xmas season - Race Freaks with bit of realistic riders feel. This will memorize your old childhood days when you use to play racing game, enjoy Race Freaks game, Play once to get real fun and adventure feel of a sport drive on the highway track. Crazy riders are moving in fast speed. You have to secure your car from other cars so that you can not collide with them. Challenge yourself and beat the high score. - Beautiful background and Awesome graphics. - Safe but High speed racer's game. Try today just a click away. 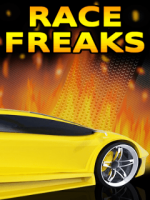 Download Race Freaks 100% fun sports app now.